If you haven't sampled the beer (or the excellent food) at the Gamble Mill Inn in Bellefonte since Mike Smith took up residence, if you haven't gotten your signed copy of Pennsylvania Breweries or Going Local yet...this Sunday is your chance! Ken Hull and I will be doing a team booksigning event there Sunday afternoon from 2 to 4:30. Ken's the author of Going Local and Going Local 2, two guide books to the best in central PA's independent eateries (and drinkeries). They're excellent, very useful, and Ken's writing style is a hoot to read: quite personal, real "looking over his shoulder" kind of stuff. I've done a book signing with him before, at Appalachian Brewing, and we had a great time. Come on out to see us; it's Sunday afternoon, it's not like you've got anything pressing, right? I will be leaving at 4:30; got to get down to Otto's for a sold-out Pub Club bourbon and beer dinner, so come early and join us for a beer! I had too many beers. On my kitchen table, that is. So I invited over some neighbors: Tom Merryman, from across the street, who's been here since we moved in, and Chris Reilly, from up the street, who's one of the Chris's at Weyerbacher. We're out on the deck now -- in the heat, yeah, but there's a breeze, and beer -- drinking up some samples. First was Wasatch Summer Twilight kolsch. Nice beer, with a good amount of grainy mess to it, reminded me of Malzmuhle in Cologne. Great start to the night, and a cooler. Second, drinking now, is one Chris brought from the brewery, a new Flanders Red type, coming out once they get label approval: Rapture. Assuming that's approved, so cross your fingers. It's good stuff: not overly acetic, the barrel character is there (but again, not overdone), dry but not puckering, and a great sour cherry character...and no cherries. It was aged in some Chaddsford Winery barrels. Thanks, Chris, nice! Next up: the upcoming Patriot Homebrew for this football season at Gillette. 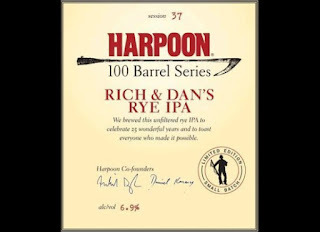 Boston Beer does a contest...oh, hell, I'm not going to explain it again. Here, read about it. So this year...it's a Baltic Porter, and it's pretty tasty stuff. A little smoky raunch, rich, tasty, but not huge. Should do well, especially when it's cold at the stadium, eh? Okay, a real fresh one: Stone Japanese Green Tea IPA, a collaboration with Ishii and Baird breweries in Japan as a fund-raiser/solidarity thing with Japan. The aroma is very fresh, like a meadow, and just as multi-variate. 9.2, and bitter, but the green tea/herbal quality keeps it fresh and lively. We're liking this; nice work! Last one: Samuel Smith Yorkshire Stingo. Wow, so nice. Very smooth for an 8% beer, and less dark than I expected. There's wood coming through, and a lot of Yorkshire yeast, and even a bit of bitter/dry curl at the end. Wow, again. And on a hot, hot night? It works. Have to do this again. Soon. Good times! York, Pennsylvania has had several microbreweries. There was York Brewing -- failed -- and Freedom Brewing -- failed -- and the Brick Oven brewpub -- failed -- and several breweries that were planned, discussed, and trumpeted...and never opened. York County hasn't done much better; we're still waiting on Hanover Brewing. We talk about The Curse: opening a brewery in York just doesn't seem to work. Two days ago, on Tuesday, Jeff Lau took his shot: Mudhook Brewing opened (at 34 N Cherry Lane, York), as reported here. Sounds like opening night was a success. To officially beat The Curse (and by "officially," I mean in my eyes...), Mudhook will have to still be in operation in January of 2013. Best of luck, Jeff and company! Got an invite to a press opening at Revolution House (I know, Facebook link, but the website they did have up appears to have been temporary...) last week, and I gotta say: it is probably the reason I failed to lose any weight on my Weight Watchers' weigh-in on Friday, despite 70+ miles of hard biking last week. My God, the food! Lemme tell you how it happened. I invited my buddy Rich Pawlak to go along with me, because he doesn't get out much, because he's good company, because he knows everyone in the Philly food/PR community...but mostly because the invite mentioned a pizza oven, and he's berserk for good pizza. We were going to meet there around 5:30, 6:00, so I headed down to Philly about 4:30. No way I was going to park in Old City, so I stuffed the bike in the Jetta, parked on the block of N. 2nd between 700 and Standard Tap, helmeted up and rode down to 2nd and Market; mostly downhill, so I wasn't really sweating much in the heat. Turned out I was early, so, well, haven't been to the re-done Khyber Pass yet: stopped in and got lucky. They still had some Deschutes Black Butte Porter on tap, and I killed a glass of that toot sweet. The Khyber is cleaner (especially the floor), and has gone for food in a big way, but the bar? Still great beer, still a bit scruffy, still laid-back sassy. Sorry the bartender stepped out of frame: she was quite cute! Back up the street, past the State Store (which of all the ones in PA, looks most like a corner liquor store; they must hate it in Harrisburg...), and into Revolution House. That's the first thing I saw, to the right (okay, the first thing I saw was the pizza oven; more on that later, and to be honest, the first thing I paid attention to...was the bar), and that's an antique back bar out of western saloon; they bought this one and the one upstairs out of Oklahoma. Very nice, and the original mirrors. Beer selection, as you might be able to make out, was nice: a good portion of locals -- Victory, Yards, Tröegs -- plus away beers like Great Lakes Dortmunder, Allagash White, Hennepin: clearly a summertime lineup, and quite welcome. I started with a Philly Pale, and took a look around. It was hard to believe that this was the old Snow White Diner, but it was. Wow, what you can do with money, hey? This is the work of Panorama's Luca Sena (Snow White owner John Poulos is in with him, and was there, looking quite calm) and designer/photographer Dominic Episcopo. 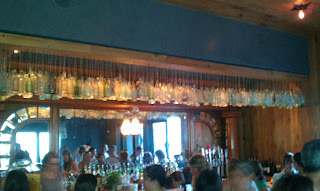 Notable bits were the see-through steel staircase up to the second floor, the antique bottles over the second floor bar (see below), the massive chandelier over the stairs, and the outdoor deck. 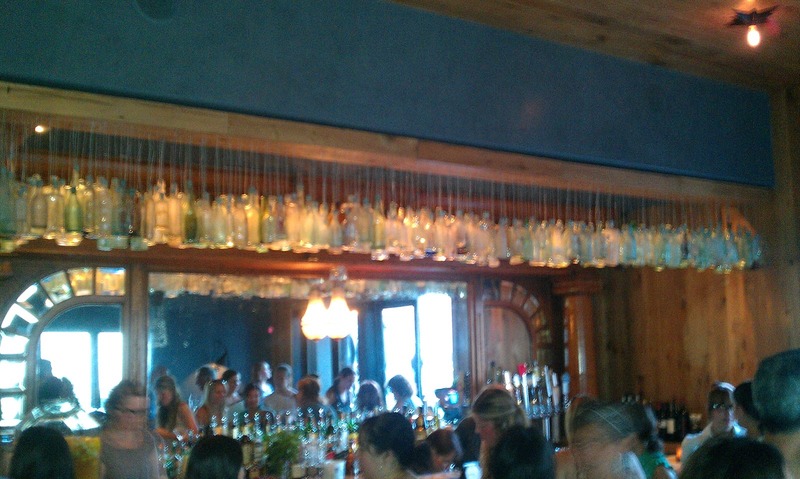 The antique bottle lighting 2nd floor bar: brilliant. But enough about the design: how about that food? As I said: pizza oven. Why you'd have a pizza oven in a place in Philly called Revolution House beats me, but damn, it was cranking. Rich started quizzing the chef about it: the oven came from Naples, and a Neapolitan pizza expert worked with them for two months, making pizza pizza pizza (Episcopo confirmed this to me, "Yeah, we ate a lot of pizzas!") until they got it. Sena said he was concerned that people "wouldn't get" the Neapolitan-style crust, which is not crisp, but more elastic, flavorful, chewy; if they don't get it, screw 'em, it was awesome. We had slices of margherita, and a proscuitto and arugula one (with bits of fresh fig) that was excellent. That wasn't what broke me, though, it was the parade of goodies. Great grilled vegetables, cheese/sausage-stuffed cippolinis, piles of fried onion straws, cheeses, soppressatta, sliders on golden rolls with what looked like free range fried eggs on top, and more, more, more: I swear, few things were repeated, they just kept bringing out new stuff. You know, even if you just have a little! It's still a lot! So we repaired to the deck -- nice, above the traffic -- and sipped beers, surrounded by the hoi polloi (as I tweeted, though, at an Old City VIP opening, you get mostly hoi, not so much of the polloi). And, finally, it was time to go...and Rich says, "Have you been to the Blind Pig yet?" I knew he wasn't talking about the famed bar in NYC, he and I have been there together, so I asked. New place in Northern Liberties, he said, and explained where it was...hell, I was parked right in front of it! So I saddled up and rode north, and sure enough, there it was. Well. Had to have one...since this was apparently my night for new gastropubs. 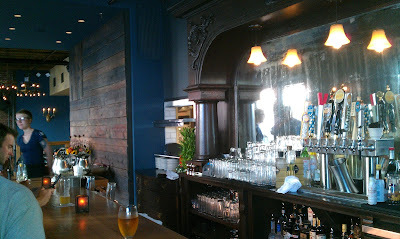 Blind Pig was nice: sidewalk dining, good beer selection, food smelled excellent, service was quite correct. I had an O'Reilly's Stout and relaxed. Or tried to, as three obnoxious women at the end of the bar just totally harshed my mellow. Lord, each trying to outdo the other with how much their cars cost and how 'the best' they were, and the new places they'd been, and how bad the service was there, and how much they were going to spend on vacation -- not where they were going to vacation, but how much it would cost! -- and it was to make you ill. I wanted to take a flash picture of them and tell them how much I was going to blog about them, but...piff. Anyway, I'd like to say they drove me out, but actually, I was done. Nice place, but go when it's a bit more busy! That stretch of 2nd is getting crazy cool, and to think it used to be a place I was nervous about parking the car. Again: the beer scene in Philly is expanding into the mainstream. Good beer at all these places, and people expect it. Keep it up, folks: it's working! Just got this from Guy Hagner. There have been problems at the brewery; I've been silent on this because there is pending legal action, but it looks like everything's coming out in the open. I understand that Tom Clark is giving a statement to Jack Curtin; check his blog for more. It is unfortunate but the business relationship with my partner [Tom Clark] has not worked out. We have agreed that the best solution is to go our separate ways. I am currently making plans to re-locate One Guy Brewing Company to another location in NE PA. I am very proud of the business I founded in Berwick and am happy for the many friends I have made there over the years. 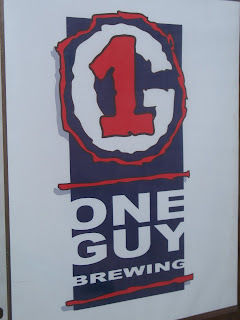 But I am also excited about beginning the next chapter of One Guy Brewing and hope to see many familiar faces as well as many new ones! I had a pretty good Coors beer tonight, Batch 19. I got the sample a few weeks ago: the embossed bottle nestled in excelsior in a shoebox-sized wooden crate...and the goofy-looking growler you see to the right. That's how it came: big mouth, and no cap. No lid at all. WTF? I Googled some Batch 19 press and event reports, and these dopey boogers apparently think a "growler" is a half-gallon pitcher. Bejayzus. Anyway...The beer itself is actually pretty good. That's the real color, it's got real body, and there's an honest to God bitterness to it. The malt/"adjunct" character is the star, though, and it's pretty tasty. I had it with steamed shrimp and corn on the cob, and I'd definitely do it again. Put me in the mind of a Dortmunder Export. As it happens, I interviewed Coors brewer Keith Villa (the creator of Blue Moon) about Batch 19 about a year ago, and since that article's been paid for a long time, I'll put it up here. Back in 2004 we had a small flood in the archives of the Coors brewery. They were in the basement. I stumbled on a box with the old brewer’s logbooks. The earliest was October of 1913, and they went right up to Prohibition in 1919. The early logbook, right before Prohibition, the beer was heavier, and had less adjunct, about 20%. When Prohibition was repealed, it went up to 33%. It was rice at the time. They noted that they were using “Chevalier” malt. It’s a variety that was considered a high quality variety in the 1800s; it’s no longer available [geek excitement over Maris Otter and Golden Promise notwithstanding, barley varieties tend to come and go pretty quickly]. The hops were only noted as “imported” and “domestic.” Whoever took the notes had handwriting that was exquisite; it was easy to read all the numbers. The temperatures were all in Roehm degrees; I had to convert all of those. Little problems at first, got over them and made the beer. 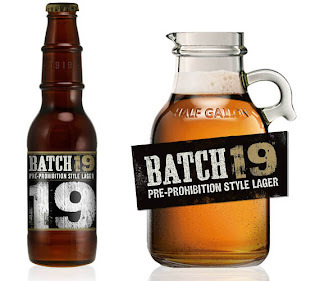 “Batch 19” was inspired by that recipe. We literally can’t get the same ingredients. The only constant ingredient is the water; we’re still drawing from the same wells, drawing from the same alluvium. Adolph Coors was pulling from that, and he wasn’t pulling much, it was a spring. The big brewery is pulling it up now. Nowadays we technically have to call it Rocky Mountain well water! That’s the only consistent thing. The water is a little bit softer now, but it’s pretty close to what they were using back then. Hops, we didn’t know what they were using. They didn’t note the variety of hops until the 1940s. Hops weren’t as afflicted by diseases and pests then, they were pretty hardy, and they stuck with the ‘noble’ varieties. So that’s what I did; I chose for the main hops Herrsbrucker, and Strisselspalt. It’s close to Herrsbrucker, but it has these notes of black currant; very hoppy with a bit a fruitiness. I stuck in a little bit of Cascade to round out the fruitiness. There’s a little Mt. Hood, and some Hallertauer Select. They added hops at the beginning, towards the end of the boil, and right before the end of the boil. They didn’t measure the color of the beer back then, but I guess that it was a nice golden color. They used pale malt. If it wasn’t dark enough, they’d add a touch of caramel malt to darken it up a bit. I used the Moravian malt that we have, the Coors strain. We have a barley breeding program up in Idaho; they improve it every year. Then I put just a tiny bit of European cara-malt. It maintains the color of the beer, and adds a slightly more complex character to the beer. It’s fermented with the classic Coors yeast. It’s fairly close… If there’s a bullseye out there to designate what beer was being drunk by people back in 1914 as Coors beer, we probably didn’t hit it, because the ingredients are different. But my guess is that we’re just outside that bullseye. I did a lot of investigative historical work to formulate it as close as possible to what they would have tasted back then. It’s got a lot of hop character, a good lager character, and it’s a bright, clear beer. It’s not pasteurized, it’s cold-filtered. It’s a real nice lager, a pre-Prohibition lager. In 2008 it won a GABF silver medal. We just released it in 5 cities: Chicago, Milwaukee, DC, SF, and San Jose. We’ll see how it does. If it does well, we’ll expand it. The stuff I’m doing and putting into the archives, I’m thinking they’ll be pulling them out in 100 years. We’d played around with the recipes for a few years. The flood of 2004…it was minor, but it could have wiped out the records and we’d have had nothing. Let’s get serious. We served it in the private bar here for employees, and people loved it. We called it pre-Pro. The marketing people found out about it, and loved it: it was a real story. It’s been fun making it. It’s a historic beer, and I like the taste. If people want to look at the logbook, it’s right there. It had always been there, but no one’s ever brewed those beers for over 50 years. There’s other stuff there, too. They made a bock beer, and they made an export version, a stronger version of Batch 19. Hope you can still find this. I got a sample bottle a few weeks ago (okay, maybe six weeks ago; I been busy) and just didn't get to it till now. Sorry I waited; glad I found the time. This is bitter, aromatic, zippy, but I still very much wanted to drink the whole bottle -- but I shared it with Cathy. Rich and Dan, of course, are Harpoon founders (technically Mass Bay Brewing founders, I believe) Rich Doyle and Dan Kenary, two very bright fellows who I've been lucky enough to know and to sink a few Harpoons with. This is, they say, the kind of beer they always wanted to make. Why didn't they? Heh. You try selling a rye IPA back in 1988! Now they had their chance, and they took it. 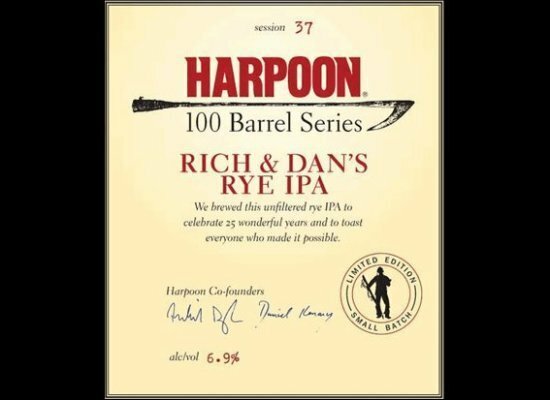 Congratulations to them, and to everyone at Harpoon, on this excellent beer. I'll have my eye out for stray bottles here and there, and will take them in and give them a good home.